After midnight. Ludo and Andre are rehearsing downstairs. They will present their play to the neighbours and other invited / passing by people tomorrow. Next door Poppy is still making samosas... It was a beautiful day with an amazing energy in the air. When I woke up this morning it felt a bit hard - another busy day ahead, but now after seing excitiment of the children and after all the help from one of the mums and older girls I feel... I had to stop as it's difficult to describe how I feel... it's something in between being satisfied, feeling peaceful and secure. Tomorrow we are having another PARTY For The Neighbours. Again, lot's of people on my floor is involved in preparation of it. We are cooking Bengali food with different families then last time. Kids prepared a puppet show. My flatmate Ludo and his friend Andre will present "The Stone Cutter" - a shadow play. Catharina ( another flatmate of mine) will do face painting together with two boys that live on my flor - Salman and Ashraf. Kids are making halloween decorations. 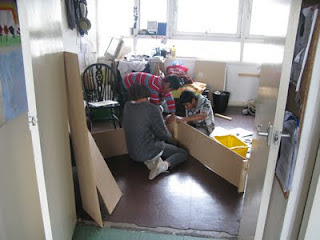 Boys are making a bench for guest to sit. 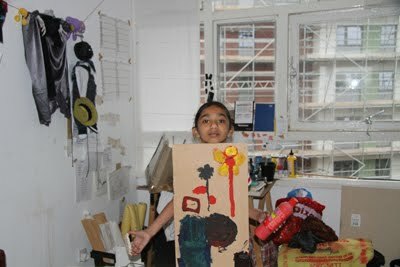 There will also be an exhibition of the work made by children. 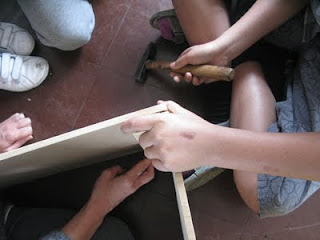 I now have regular workshops with children, which happen every Saturday or Sunday. I mostly work with 7 of them, but sometimes group is as big as 15. This is usually when their cousins are around and they join in. Their mothers are visiting my flat during our art classes, often commenting on the work or giving advise to children. 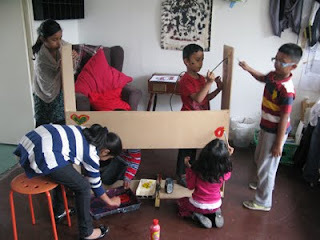 We all work towards another 'party for the neighbours' day (in two weeks time) making different types of puppets, building theatre stage and writing stories. We also collect footage for the film and paint a lot. Sometimes we play music. 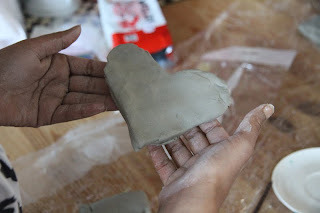 Today I went to an art shop and brought lot's of clay, canvas and few other things that we haven't used before. We tend to experiment a lot, so children can get used to various types of materials and learn new ways of assembling them. We also started analysing work that is being made. I keep asking questions about the colours they used or the choice of material etc .... When they feel like they'd made a bad work we try to find other way of looking at it or a way to improve it. It's important that they don't see moments like that as final or as failure, but rather as a temporary problem that can be solved. On other days my doors are open to a little bit older neighbours. We write CVs and part-time job applications. We talk about the importance of education, especially once they still have it free. 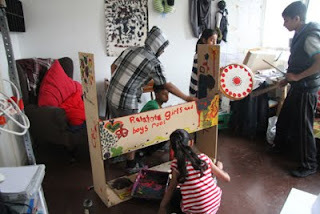 Today I thought that it would be great to involve mothers in running other art classes. One of the mums can do pottery and it would be amazing if she run workshop on it. I decided to spend the next few months on looking for a funding. Let's see how it goes. Today we were making a stage for a puppet performance that will happen in a few weeks time. During our workshop one of the girls said that we have to vote for the best title of the show. She collected proposed ideas from everyone. She said that all of us should vote as otherwise it would not be a democratically made decision. She had a very clear idea of what democracy meant.